It really isn't possible to put on a truly traditional Christmas dinner with that most iconic of Christmas foods - the Christmas pudding! But you can't just put any old thing on the table, you need a proper traditional English recipe and - if you can - you need to get your Mum or your Gran to make it otherwise it just won't taste right. Yes, making it is an utter faff, and yes, you need to make it a couple of months before Christmas - but get it right and your family will love you, and the presents you bought them, even more! This recipe makes one large pudding in a 2 pint (1.2 litre) basin. 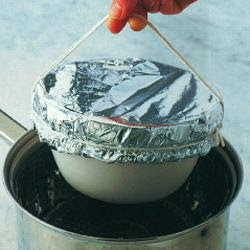 If you have any left over you can re-heat it, wrapped in foil, in the oven next day. If you want two smaller puddings, use two 1 pint (570 ml) basins, but give them the same steaming time. If you can't get barley wine, use extra stout instead. Begin the day before you want to steam the pudding. Take your largest, mixing bowl and start by putting in the suet, sifted flour and breadcrumbs, spices and sugar. Mix these ingredients thoroughly together, then gradually mix in all the dried fruit, mixed peel and nuts followed by the apple and the grated orange and lemon zests. Don't forget to check the ingredients list to make sure that you haven't left anything out. Now in a smaller basin measure out the rum, barley wine and stout, then add the eggs and beat these thoroughly together. Next pour this over all the other ingredients, and begin to mix very thoroughly. 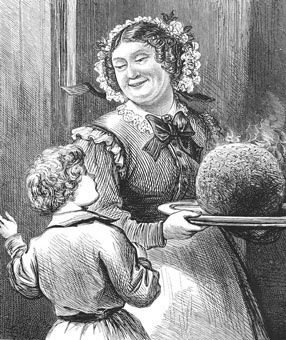 At this point, it's traditional to gather all the family round, especially the children, and invite them to have a really good stir of the pudding mix and then to make a wish! The mixture should have a fairly sloppy consistency – that is, it should fall instantly from the spoon when this is tapped on the side of the bowl. If you think it needs a bit more liquid add a spot more stout. Cover the bowl and leave overnight. Next day, pack the mixture into the lightly greased basin, cover it with a double sheet of baking paper and a sheet of foil and tie it securely with string. It's also a good idea to tie a piece of string across the top to make a handle. 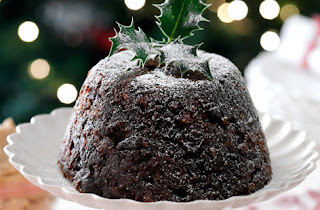 Place the pudding in a steamer set over a saucepan of simmering water and steam the pudding for 8 hours. Do make sure you keep a regular eye on the water underneath and top it up with boiling water from the kettle from time to time. To cook, fill a saucepan quite full with boiling water, put it on the heat and, when it comes back to the boil, place a steamer on top of the pan and turn it down to a gentle simmer. Put the Christmas pudding in the steamer, cover and leave to steam away for 2¼ hours. You'll need to check the water from time to time and maybe top it up a bit. 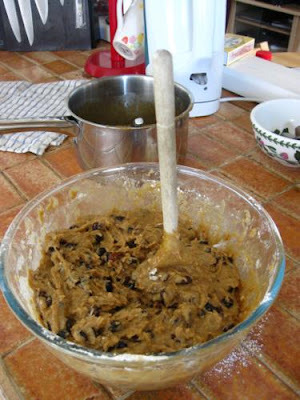 To serve, remove the pudding from the steamer and take off the wrapping. Slide a palette knife all round the pudding, then turn it out on to a warmed plate. Place a suitably sized sprig of holly or mistletoe on top. Now warm a ladleful of brandy over direct heat, and as soon as the brandy is hot it can be lit. Place the ladle, now gently flaming, on top of the pudding – but don't pour it over until you reach the table. When you do, pour it slowly over the pudding, sides and all and watch it flame - close the curtains and turn off the lights for the best effect! Serve the pudding with rum sauce, or rum or brandy butter.